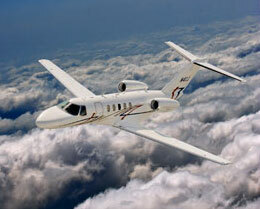 The Cessna Citation CJ4 business jet was developed as the larger and faster version of the Citation Jet CJ3. 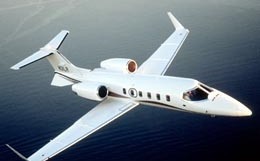 Featuring a large, luxurious cabin, capable of seating up to eight passengers and two crew members, the Cessna Citation CJ4 delivers an impressive speed of 521 mph and lengthy range of 2002 nautical miles, while still maintaining all of the great runway characteristics you expect from a Citation. A longer, superior derivative of the Citation CJ3, the CJ4 is the latest representation of the continual evolution of the Citation Jet line. Announced in late 2006 and fully certified by 2011, the Citation CJ4 combines the time-tested, simple yet effective charm of the Citation Jet line with modern innovations and a larger, wider cabin. Although inherently similar to its predecessors, Cessna has made it tradition to work on improving what has already been proven to be effective, reliable, and economical. Regardless of its shared foundations with other Citation Jets however, the CJ4 brings with it impressive new features to supplement Cessna's high standard of performance and reliability. The addition of a new wing structure, more powerful engines, and improved avionics builds upon what makes the Citation line one of the most popular series in the business jet industry. Private travelers who appreciated the previous entries in the CJ series will enjoy the same versatility, cost-efficiency, and quality complemented by modern technologies and a more luxurious interior. Taking full advantage of indirect lighting, seamless panels, and even mirrors, the interior of the CJ4 has been meticulously designed to promote a spacious and comfortable atmosphere, without sacrificing cost-efficiency and value. Combined with the fact that the CJ4 is actually physically larger than its predecessors, a significant atmospheric difference is almost impossible to overlook. Its interior dimensions of 17' 4" cabin length, 4' 10" cabin width, and 4' 9" cabin height provide 311 cubic feet of cabin volume and 65 cubic feet of baggage space. Although the CJ4 can most comfortably carry six to eight passengers in a spacious seating arrangement, the aircraft can handle a maximum capacity of nine passengers in a higher-density seating arrangement. Cabin entertainment is available in the form of standard amenities such as a full multimedia entertainment system with intuitive control panels. A fully-enclosed lavatory also comes standard. And even though the interior of the CJ4 harbors no extreme, jaw-dropping surprises, it's certainly easy to appreciate the improvements to comfort, luxury, and space. Consistent with Cessna tradition, choice of engine was based on providing maximum power while avoiding excessive operation and production costs. 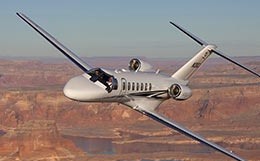 From the same family of engines used in previous Citation Jets, the CJ4 utilizes Williams International FJ44-4 turbofans. The largest and most powerful FJ44's in any CJ, each engine provides 3,400 pounds of thrust. The CJ4 has a certified flight ceiling of 45,000 and has a maximum cruising speed of 453 ktas, significantly faster than the CJ3. Boasting impressive ground capabilities as well, the CJ4 can take off in just 3,300 feet at sea level. Its cockpit is equipped with advanced ProLine 21 avionics, which allow four flat-panel monitors to display imperative navigation information to the operator. This ensures complete situational awareness and safety. Digital charts, approach plans, and weather conditions can all be accessed easily. 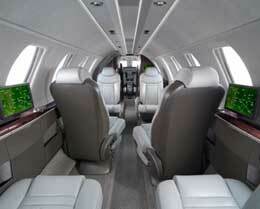 Its intuitive control panel allows the aircraft be operated by one pilot adding further versatility and flexibility. The CJ4 may not present any overwhelmingly revolutionary changes, but it builds upon what has already been proven to be one of the best in terms of economical value, efficiency, and performance. For more information about chartering, leasing or buying a Citation CJ4 please contact us by calling +44-20-3874-8091 or send us an email here.